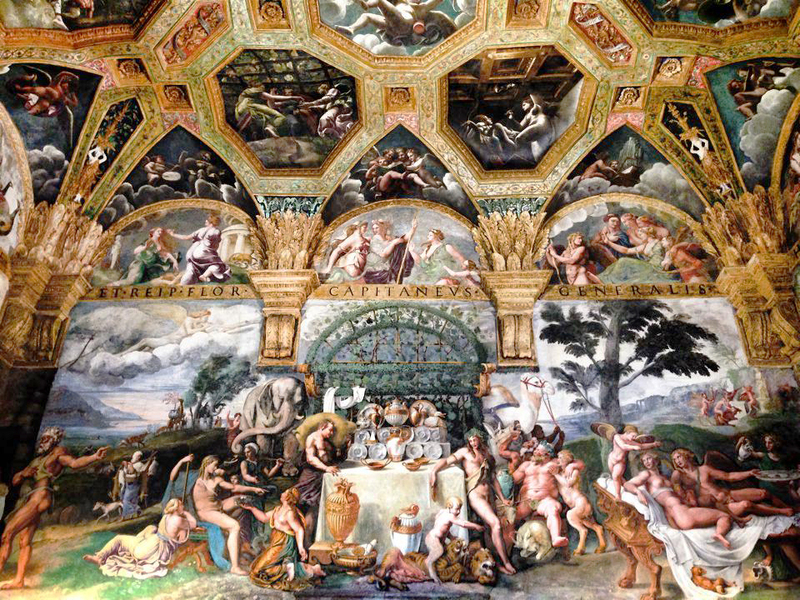 Mantua (Mantova in Italian), is one of Italy’s best kept secrets for a romantic weekend getaway. Full of palaces, churches, pastel-colored homes and narrow cobblestone streets, this town certainly possesses a lot of beauty and charm. We booked the “Leone” Suite at Palazzo Castiglioni – which I highly recommend staying at if you decide to visit Mantua. Newly-renovated with beautiful hard wood floors, large rainforest shower in the spacious bathroom, the suite also boasts accents of red and gold jacquard in the window treatments, bed drapery and sofas. Not to mention our view – 3rd floor, overlooking Piazza Sordello directly across from Palazzo Ducale. Walking around town can best be described as a multi-sensory experience. You can hear the sound of live music being played in the streets, the smell of roasted castagne (chestnuts) and wood burning in people’s fireplaces stirs up memories of past autumns. The sun beams kissed my face as I strolled hand-in-hand with Giorgio past flocks of people both locals as well as tourists. (You can always tell who the locals are by their super-relaxed content facial expressions). Note to self: People seem really happy living here. When you can take your morning jog along the Mincio River, wake up to the local churchbells ringing, start drinking Aperol Spritz at 11:00am, take 2-3 hour afternoon resting breaks during the work-week, get around anywhere by foot or classy bicycle, buy local produce at the market and transport it in your classy basket attached to your classy bicycle…you get the point. This towns’ got mad charm yo. The local clock tower features the Bartholomew clock which was designed and crafted ​​by Bartolomeo Manfredi – mechanic engineer, mathematician and astrologer to the court of the Gonzaga. The hours are marked by Roman numerals and dials also indicate the signs of the zodiac, the planetary hours and the phases of the moon. Below are a few photos I took, the one on the right shows the original mechanism built in 1473 and still working perfectly. There are two famous Palaces – The Palazzo Ducale and Palazzo Te. It takes about 2-3 hours to walk through each and learn about the history of the region and nobility that once resided there. 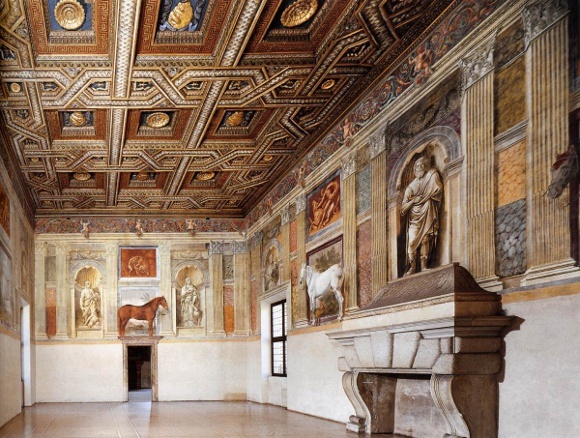 Built in the 14th Century by the Gonzoga family, Palazzo Ducale consists of about 500 rooms, occupies an area of 34,000 sq meters and boasts magnificent frescos by Mantegna. Monteverdi also held performances at the Palazzo Ducale in the late 16th century. 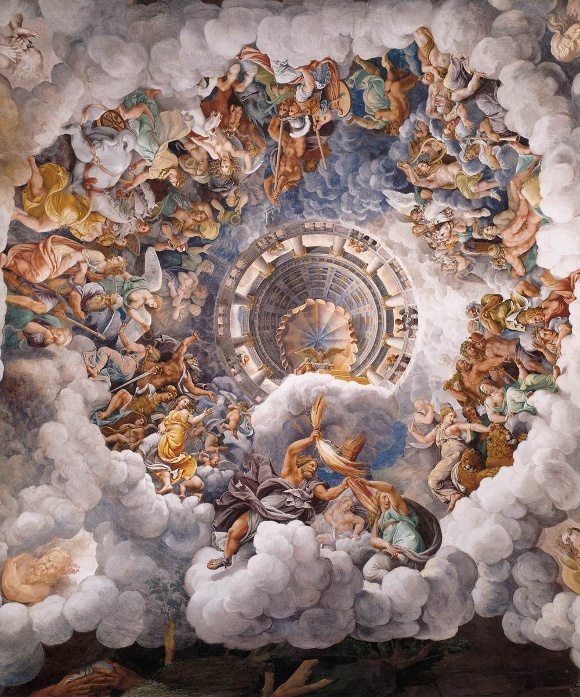 Palazzo Te was the “Pleasure Palace” or place of leisure built by the famous architect Giulio Romano for Federico II Gonzaga, Marquess of Mantua. The ceilings of the rooms are breath-takingly elaborate. Below are some photos from both Palaces. For home-style risotto that is truly delectable and mouth-watering, a little local place called Osteria Dell’oca is the place to go. Accredited by La Accademia Europea del Risotto alla Mantovana, the Owner and Chef is a seasoned pro when it comes to making risotto. 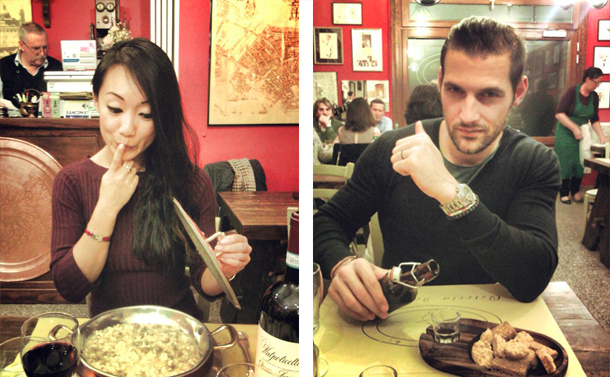 Try the Risotto alla Mantovana – which features local sausage and is served in a copper pan.